2 0 1 5 S E P T E M B E R P R I N T W E A R || 85 onds. Now, we're going to cut the neck off the bottle at a diameter of 1.5" and find out the bottle fills up in less than one second. This is in small part be- cause the neck is gone, but mostly be- cause the opening is larger. Now don't forget we're printing sticky, tacky, goo- ey, icky white ink, not water, so the opening in the shorter bottle is four times larger to facilitate ink transfer, and it is shorter so the white ink, made not to penetrate, doesn't have to trans- fer as far. What we've found is the pre- ferred mesh in this instance will have a sufficiently higher capacity to fill the woven or knitted construction of the garment, a higher fill-rate, a larger opening and a shorter tunnel—more of a wide-mouth jar rather than a wine bottle. Even though the white is stickier and harder to transfer, it will often be printed with other colors on different meshes. There is a foolish preoccupa- tion among us to take screen mesh to absurd tension levels. Bear in mind that we need to consider not only the static tension, but the equally import- ant delta or change in tension. Let's set our press precisely at 3/4-gap. The 25N/cm^2 120/80 mesh will have a delta at the center of 5N/cm^2 and 20N/cm^2 at the edges of the screen. At a static tension level of 25N/ cm^2, the 305/40 will have a delta of 2N/cm^2 at the center and 15N/ cm^2 at the edges. The 120/80 for the white will print at 30/45N/cm^2 and the royal blue on the higher count will print at 27/40N/cm^2; we can't expect them to line up. We must either adjust static tension so the dynamic tension of these two counts matches up, or ad- just the gap to achieve a similar result. T H E L A N G U A G E O F I N K I nk labs are full of talented chemists who create the recipes for the ink. How- ever, when we call for assistance, it is rare we would ask a chemical ques- tion. When we have a problem on-press we don't generally think in terms of chelating agents, free-radical reactions, Hansen's solubility parameters, or hydrogen end groups. In general, we want to know one of three things; 1) how does it look, 2) how does it flow, and 3) how does it stick? These questions about optics, rheology, and electrovalent bonding are per- haps better put to a physicist than a chemist, but nonetheless we should at least understand there is a basis for the design of the white we print in terms of on- press performance. 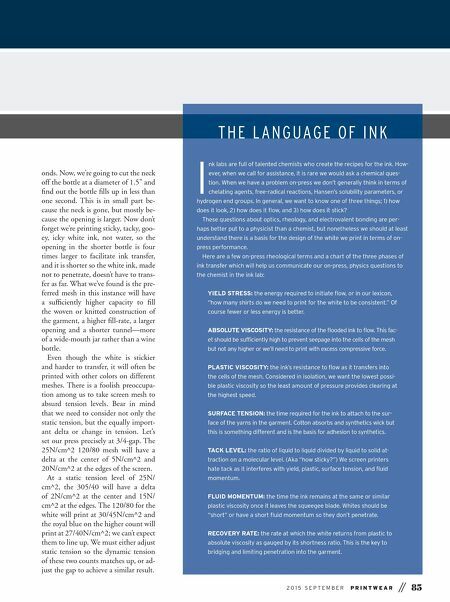 Here are a few on-press rheological terms and a chart of the three phases of ink transfer which will help us communicate our on-press, physics questions to the chemist in the ink lab: YIELD STRESS: the energy required to initiate flow, or in our lexicon, "how many shirts do we need to print for the white to be consistent." Of course fewer or less energy is better. ABSOLUTE VISCOSITY: the resistance of the flooded ink to flow. This fac- et should be sufficiently high to prevent seepage into the cells of the mesh but not any higher or we'll need to print with excess compressive force. PLASTIC VISCOSITY: the ink's resistance to flow as it transfers into the cells of the mesh. Considered in isolation, we want the lowest possi- ble plastic viscosity so the least amount of pressure provides clearing at the highest speed. SURFACE TENSION: the time required for the ink to attach to the sur- face of the yarns in the garment. Cotton absorbs and synthetics wick but this is something different and is the basis for adhesion to synthetics. TACK LEVEL: the ratio of liquid to liquid divided by liquid to solid at- traction on a molecular level. (Aka "how sticky?") We screen printers hate tack as it interferes with yield, plastic, surface tension, and fluid momentum. FLUID MOMENTUM: the time the ink remains at the same or similar plastic viscosity once it leaves the squeegee blade. Whites should be "short" or have a short fluid momentum so they don't penetrate. RECOVERY RATE: the rate at which the white returns from plastic to absolute viscosity as gauged by its shortness ratio. This is the key to bridging and limiting penetration into the garment.